Nigeria’s president Muhammadu Buhari and his administration have spent much of the last two and half years since he came to office championing the idea that for Africa’s largest economy to have any hope of making meaningful progress it needs to diversify away from its reliance on oil. But that day has not come. In fact, president Buhari will be relieved oil prices and local production have both picked up pace in the last few months because they have combined to help Nigeria record two consecutive quarters of economic growth for the first time since the end of 2015. It might seem like a minor milestone, but after five straight quarters of the economy shrinking, it represents much more. Over the past year, Nigeria had been mired in its first recession in over two decades but latest data from Nigeria’s statistics bureau (NBS) shows that the country’s recovery, albeit slow, is on track. It recorded 1.4% growth in the third quarter. Nigeria’s recession was triggered mainly by troubles in its oil sector. The fall in global oil prices coincided with a brief resumption in militancy in Nigeria’s oil-rich down south which caused oil production levels to fall to 20-year lows. As a result, Nigeria’s oil revenues fell sharply and, to stem the bleeding, the central bank set up currency controls to conserve its foreign reserves but that spawned a dollar shortage which hit local businesses hard. 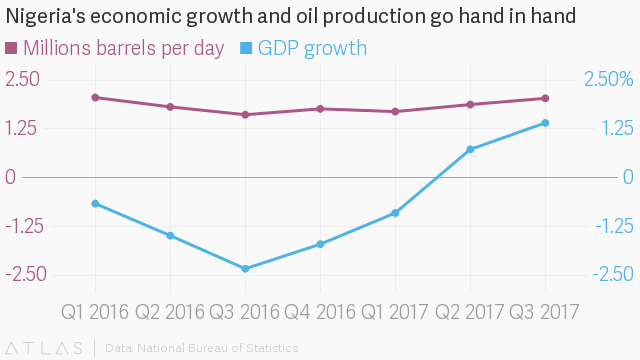 As always, the turnaround in Nigeria’s economic fortunes is linked to its oil. In the third quarter of 2017, oil production has reached its highest point since the first quarter of 2016, NBS data shows. 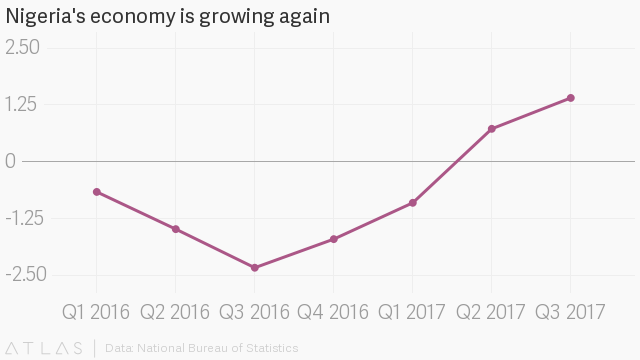 Nigeria’s president Buhari will certainly be hoping the growth streak continues. With only one full year left in office, Buhari has proposed a $23.9 billion record budget for 2018. But to fund it, Nigeria will have to step up its oil production even more as the budget is based on oil production of 2.3 million barrels per day—around 200,000 more than it currently produces. Another way the government plans to shore up the deficit budget is through external borrowing. Its latest dollar eurobond launch is looking to raise at least $2.5 billion and is reportedly on course to do so. It follows on the heels of a $1 billion eurobond loan raised in February.